Eve’s Wine 101 blog is less than a year old. 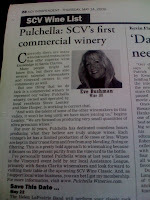 I started it as I had more to say about wine than my local newspaper could fit into my weekly column. Then I left the paper in February of this year. And that’s when the blogging really took over! What was a 1-3 times a week posting by me has morphed into the Wine 101 Magazine of SCV. When I was in Italy I asked friends, relatives, winemakers and Facebook friends to write guest posts. Then I invited non profits to send their press releases for events with wine. Of course it followed suit that I would run press also for local wine businesses and, for non-profits and businesses further out that had something different to offer readers – with an emphasis on wine. On the left side of this blog you will notice a row of art with links for different events that I am highlighting. You can learn more about the charity each supports by clicking on any of them. Currently we have Wishes for Children Journey at Pechanga 9-18, Betty Ferguson Foundation’s Woman of Honor Dinner 9-19, Soroptimist of Greater Santa Clarita Valley’s The Wine Affair: Sip Savor and Stroll on 9-27, The 2nd Annual TPC/West Ranch Art & Wine Gala on 10-3, All Corked Up’s International Festival, Wine for Water ongoing events and awareness for KIVA loans. Michael Perlis provides outsourced controller services to businesses that do not need a full-time controller. He balances this with his interest in wine, reading and writing about it and, of course, drinking it. He is still trying to figure out how to combine these two pursuits. Feel free to contact him about either. Rusty Sly is a Rocket Scientist that has an insatiable love for fine as well as unique wines. Being technical with an engineering and chemical background, he is driven to pursue all aspects about wines. His studies include, but are not limited to, wine production, chemistry, etiquette, cultures and terroir. His motto to everyone is to look for and try wines that are unique and different. 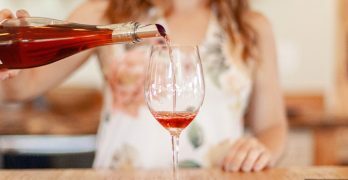 SCV Vintners and Growers Association is a well-rounded group of local folk that get together to taste wine and help each other at harvest and bottling. They sometimes send “updates” from their meetings and tasting notes. Steve Lemley, from the SCV Vintners and Growers Association, sends updates on Pulchella Winery that he owns with Nate Hasper. Slated to be Santa Clarita’s first commercial winery and tasting room…could be excellent news! Denise Lowe has been collecting and learning about wine for many years, and there is nothing about which she is more passionate. 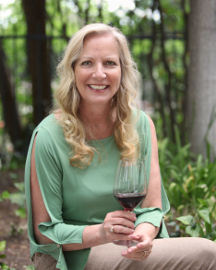 She is a certified Junior Wine Executive through LearnAboutWine (www.LearnAboutWine.com), and is now teaching classes as a Senior Educator at LearnAboutWine. Denise also hosts guided, in-home wine tastings through WineShop at Home, a bonded Napa winery (www.denisemlowe.com). Sunday Wine Recipe People that enjoy wine enjoy food, as it goes hand it hand, so look for recipes on Sunday from wineries, chefs, my husband and YOU. Stories in Photos Readers send one or two photos and they are highlighted on the top o’ the blog and slowly scroll down the page. If you have 3 or more they are then placed as a blog post. Some are professional photographers; some amateur. All are worthy of a view. 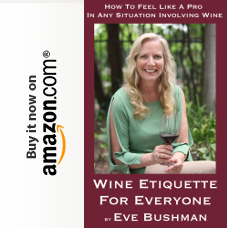 Eve Bushman I love putting non-profit events in the limelight, receiving your press releases, keeping up with the awesome array of tastings and talent. Seeing the wine world through my 101er eyes…well…has been an awesome ride so far. Thanks for taking the trip with us so far! Hmmm…a learnaboutwine.com educator…who could she mean? I promise I'll add some value to your blog! Looking forward to seeing you doing the pouring on the 28th! Yes, Denise, your posts are very valuable to wine 101 readers! And, your patronage on 9-28 (Valencia Wine Company, 4-8pm, Eve is working for charity!) will be appreciated! You're such a Goddess! I can't wait to see Denise's posts. If she's half as knowlegable about wine as she was about scotch, I'm in! Okay, so I guess I should edit the "learnaboutwine.com" instructor to Gooddessofwine contributor – with a bio on this post! I'm honored to be included in the list of contributors. I'm honored to have such honorable contributors! Now if we can just get the Snark to write about her trip to Napa last week…we should be set!